Cakestar, after a bout of coughing, announced, “A patrol. A patrol should go to confront the problem.” Her deputy nodded in agreement. Once the cats had left, the whole clan was left with a gripping anxiety that seemed to blanket the whole camp. Owlsong could hear murmurs among her clanmates. “What if…what if they don’t make it?” another cat whispered fervently. When the patrol finally returned, they were beaten up pretty badly. Nonetheless, victory shone in their eyes and the feeling of relief was palpable in the air. It felt as if the rest of the clan let out a collective sigh as they let out the breaths they’d been holding. “The badger has been driven away and is now far from our new territory!” Copperclaw announced to the clan. The deputy’s muzzle had been raked and Owlsong noticed she was limping slightly, but the she-cat still looked as ferocious as ever. The patrol shuffled to the medicine cat’s den where Dawnmist and Silverwind went to work chewing up what little herbs they had into poultices and spreading cobwebs over the warriors’ wounds. After everyone had been looked after, the cats that had been on patrol laid out in the sun for a well-deserved rest. Owlsong looked to the fresh-kill pile, half hoping that by some magical means, there’d be some food to offer to Jayfrost and the others, but as soon as she laid eyes on the space in the center of camp, Owlsong wondered why she’d even spared a sliver of what hope she still had. A little while later, Owlsong noticed that the leader had come out of her den to congratulate the patrol, the young warrior guessed. Without Copperclaw to support her, Cakestar looked more unsure on her paws than she had before and Owlsong frowned. Trotting over to the reddish cat, she let out a greeting meow. Cakestar waved her tail in reply. “Good day, Owlsong,” she mewed hoarsely. “I was, but…” The leader was cut off by a bout of violent coughing. “Cakestar, are you alright?” Owlsong asked in alarm, her ears pinned back against her head and her blue eyes wide. Cakestar didn’t answer. She couldn’t. Unsure of what to do, Owlsong tried to support her leader, letting her lean against her side. Owlsong led Cakestar to the medicine cat den and called for Dawnmist. Silverwind was the one who stuck her head out. “What is it now?” the silvery cat grumbled. But when she saw Cakestar, she raced out to help the leader into the den. Owlsong was given a small piece of moss and instructed to go soak it in some water. Searching frantically, she finally found the small stream near the camp. She dipped the moss into the burbling water and hurried back to Silverwind. Upon arriving, Owlsong saw that Cakestar’s coughing had intensified. She set the dripping moss in front of the leader, whose hacking paused for long enough for her to take a few laps. The coughing began again immediately after, eliciting a wince from both Owlsong and Silverwind. However, it seemed to be softer now; less harsh. Eventually, it died down completely, but by then, Cakestar was spent, her energy sapped from the fit. The leader flopped down in the nest, asleep, though her breathing was still rough. Owlsong found herself pacing. Her mind buzzed with worried thoughts. Would Cakestar be alright? She’d been obviously sick for a while, but now it was getting worse. Had anyone else seen the leader’s recent fit? Did Dawnmist and Silverwind have the right herbs? Did they have anymore herbs at all? Would they be able to diagnose Cakestar’s illness? How was Cakestar doing now? These questions and many others were what occupied Owlsong’s thoughts until a voice broke her anxious pacing. It belonged to Sageheart. “Yeah. I’m fine,” Owlsong replied curtly. Sageheart regarded her doubtfully. “No, you’re not. Something’s bothering you, isn’t it?” Owlsong nodded reluctantly, not keen on showing her worry. “Well, what is it?” Sageheart prompted. Over the next day or so, the news spread throughout the clan like wildfire. Cats constantly had their heads together, murmuring to each other. With all the talking, Owlsong couldn’t help but overhear some of the conversation. “What if Cakestar doesn’t make it?” she heard Jackalstep say. “How many lives does she have? Surely still nine…” Sundance fretted. 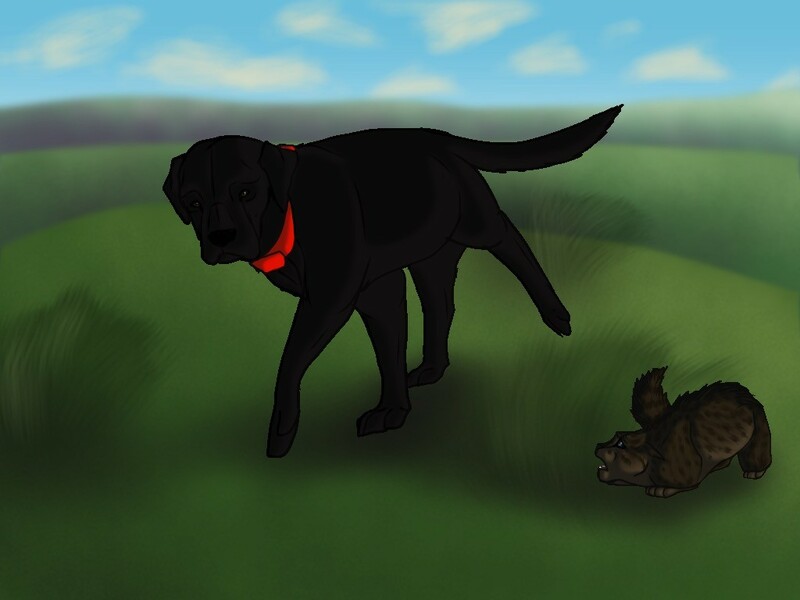 “Do you think Copperclaw will have to become leader sooner than expected?” queried Scarletpaw. Owlsong knew most of the chatter and gossip was absurd, but she couldn’t help getting caught up in the new wave of stress that was washing over the clan. First the badger, now this. Not to mention, the fresh-kill pile was still as bare as a deciduous tree in winter, with perhaps a tiny mouse or shrew lying there pitifully like the last couple dead leaves that refused to fall from the branches. Later that evening, Dawnmist emerged from the medicine cat den. She looked exhausted. She was frowning and her expression was one of worry and disappointment. The silvery she-cat bounded up onto Highledge. “All cats old enough to catch their own prey gather for a clan meeting,” she called. Her voice sounded distant and uncomfortable and Owlsong couldn’t help but notice that it looked as if Dawnmist had been dreading this. The clan gathered hesitantly. They seemed unsure of what to expect. Owlsong padded into the clearing and sat between Darkshine and Honeypaw. “Do you know what’s going on?” Darkshine whispered to her. Once everyone had settled down, Dawnmist began. Of course, her response made most of the older cats a bit suspicious and wary. Owlsong sighed. They don’t have the herbs… I know Dawnmist is just trying to keep everyone calm, but… The young warrior frowned and padded back to her nest. I have a feeling Cakestar won’t be fine. Not for a while, anyway. Two more sunrises and sunsets had passed since Dawnmist’s announcement and the clan was falling into despair. Copperclaw had been acting as leader in Cakestar’s absence, but it was growing hard to keep everything in order. Now, a deep-set mourning was gnawing at Owlsong’s stomach in addition to the hunger that was still plaguing BlogClan. Around sunhigh, Silverwind approached her. “As a matter of fact, I do… Cakestar’s greencough isn’t getting any better. Dawnmist and I have tried looking for catmint, but we haven’t been able to find any on our territory,” the medicine cat apprentice told her glumly. “And you need help looking for some?” Silverwind nodded. Twolegplace? Owlsong shivered slightly, remembering the trip she’d taken with the patrol to go find food there. When she reached the den, Owlsong saw that Rainsong and Nightflower were already waiting. She lapped up the traveling herbs quickly, grimacing at the bitter taste. “If we had any fresh-kill, I’d tell you to eat before you left.” Dawnmist emerged from the back of the den where Owlsong assumed Cakestar was. She continued, “The traveling herbs should quell your hunger for now though. The green-eyed she-cat touched her tail to Rainsong’s, Nightflower’s, and Owlsong’s shoulders respectively, wishing them good luck. Silverwind walked with the three cats to the camp entrance. “May Starclan light your path,” she told them, and left to go back to the medicine cat den. Owlsong took a deep breath, looking over at Rainsong. Her friend gave a small nod and they were off. As they walked, Owlsong tried to keep her nose open to smells. Most of them were earthy, but there would be the occasional whiff of stale badger scent, awakening unwanted memories of the fear of BlogClan being massacred by that beast. Owlsong shook her head clear of these thoughts, choosing not to dwell on them. Besides, they had to be on alert for any real threats. When they finally reached the edge of the territory, Nightflower raised her tail, signaling for the other two to pay close attention to their surroundings. Owlsong and Rainsong followed close behind, surveying the open field carefully before heading out from under the cover of the trees. After they’d been walking for about thirty minutes, Rainsong suddenly halted, standing stock still. The she-cat’s blue eyes were round and her ears swiveled back and forth. “Rainsong…do you hear something?” Owlsong whispered to her friend. Rainsong didn’t reply, so Owlsong scented the air herself. Her hackles rose when she recognized the smell. Nightflower yowled, “Everyone, hide!” Owlsong looked frantically for a hiding spot, finally settling on a thick clump of grass. She didn’t have time to try to locate Nightflower and Rainsong. A few moments later, she could see a large black dog snuffling around. Owlsong held her breath, watching the dog intently, hoping it wouldn’t find her clanmates hidden elsewhere. After a couple tense minutes, a whistle sounded from the edge of the field. The dog’s ears perked and it ran off when the whistle came a second time. Owlsong waited until she was sure the coast was clear before she meowed to her companions. Nightflower’s head appeared from beneath a small bush, and Rainsong revealed herself not long after. She let out a sigh of relief. “That was way too close,” Owlsong muttered. Hopefully we won’t have this much trouble at Twolegplace… Her optimism felt fake to her, though, and she didn’t quite believe herself. Nightflower managed to catch a fat mouse a while later. All three of them were overjoyed and they each ate their few bites ravenously. Owlsong felt a bit guilty at first. They’d been able to have a small meal while the rest of the clan was going hungry. However, her hunger spurred greed and Owlsong’s guilt soon vanished. It was another hour or so before Twolegplace came into sight. Owlsong was left with a mixture of joy and dread, and the young warrior couldn’t decide which emotion she should listen to. Rainsong, Owlsong and Nightflower stopped at the edge of the fields. Stretching out before them was the thunderpath, and beyond that lay the many homes of Twolegplace. The rancid scent of cars reached Owlsong’s nose almost immediately, an odor she wasn’t exactly thrilled to greet again. Cars whizzed past their noses, seeming to race each other as they rumbled down the street. Nightflower glanced over at her and Owlsong shrugged. An eternity seemed to pass as they sat there, waiting patiently for the cars to decide to let them through. By the time the signal was given by Nightflower, Owlsong’s nose and paws had gone numb. Jerked out of her doze by the black she-cat’s yowl, she sprinted after Rainsong, who’d run ahead of her. She could already see a car coming towards them, but they were nearly across the thunderpath already. Owlsong only had a little ways to go when she stumbled on a stone. Nearly having a heart attack, she scrambled to the safety of the grass just a few seconds before the car hurtled past. Time was spent going over a plan. They decided to stick together to investigate the gardens versus splitting up. It wasn’t really a plan. In fact, their “plan” was mostly constructed of obvious courses of action, but it felt nice to feel like they’d actually come up with something. It was a reassurance bobbing in an ocean of doubt. Owlsong scrambled up onto the fence bordering a large garden. Nightflower and Rainsong joined her soon after. They padded single-file along the fence line, careful to keep their senses alert for both the catmint and any possible dangers. Every so often, a dog’s bark would sound a few houses over and the three cats would freeze in their tracks until the animal quieted. This slowed their progress significantly, but Owlsong supposed it was better to be safe than sorry. The three of them searched through garden after garden until the sun started to sink towards the horizon. The morale had plummeted and it started to seem like they would never find the precious herb. They would fail and have to return empty-pawed to a dejected clan and its dying leader. Eventually, they reached the bins where Owlsong remembered looking for food. She wrinkled her nose at the sight of them, trying to ignore the tantalizing smells emanating from them. “We have to keep searching,” Rainsong pleaded. The three sat in a tight circle after deciding it was time for a rest. The traveling herbs had worn off long ago, and Owlsong’s feet felt like lead. Rainsong and Owlsong looked over at each other before they each nodded. They’d reached a consensus. Sundown was approaching fast, and they’d still found nothing. Owlsong was falling asleep on her paws, stumbling along after Nightflower on top of the fence. Her mind was growing fuzzy and her thoughts became muddled and random. On the next step she took, her front paw slipped and down she went, crashing into the garden below. The branches of the rhododendron bush scratched at her pelt, but in broke her fall somewhat. Owlsong expected the soft dirt of a flowerbed, but instead, she landed on a different sort of soft thing. This thing let out an angry hiss and wriggled out from beneath her. “What do you think you’re doing in my garden?” the thing growled. The furry thing she’d landed on, which Owlsong identified as a kittypet, was lashing his tail furiously. “I’m terribly sorry!” she mewed. “I didn’t mean to land on you, or even come into your garden.” She looked up at her companions and told them silently not to follow her. “Then why’re you still here?” the kittypet sniffed. “One of my friends is gravely ill. I need the catmint to heal her. I won’t need much, I promise.” The kittypet huffed but nodded his permission. “Thank you very much! You don’t know the good you’re doing,” Owlsong told him, eyes shining. She headed to the front of the house, and sure enough, a familiar scent greeted her. It smelled just like the catmint she grew in her garden for her own cat, back when she was human. Once she’d retrieved as much catmint as they would need, the warrior returned to her friends, who practically radiated with happiness. The three hurried back to camp as quickly as possible, each of them with a bundle of catmint in their jaws. They burst through the entrance not long before moonhigh and the few cats that were still awake looked up, startled. Cakestar’s coughing rang through the silence; the only thing disturbing the peace. Owlsong, Rainsong, and Nightflower raced to the medicine cat den. Upon entering, they could see that the two cats inside were ready to drop from fatigue. They’d obviously had to stay up with Cakestar and tend to her. Owlsong dropped her bundle of catmint at Dawnmist’s feet. “Sorry we took so long.” Both medicine cats’ expressions were ones of utter relief. They managed to ease Cakestar’s cough for a minute and coaxed the leader to eat a few of the leaves. By the time sunrise rolled around, about half the clan already knew of Cakestar’s gradual recovery. The camp was alive and humming with excitement. No one seemed to know of the three cats that went to go find the herbs, but that was fine with Owlsong. She was just glad that BlogClan wasn’t in danger of losing its leader. Without the oppressive anxiety, BlogClan was able to get back into a semi-regular routine again. Prey was still hard to come by, though, and the good news surrounding Cakestar didn’t do much but mask the larger problem of food and provide something for the clan cats to distract themselves with. A little shred of hope. BlogClan hung onto that shred though, still managing to cling to the branch of a dead tree like one of those winter leaves that refused to be blown away by the wind. Kate Cary's son. Not evil. We hope. 39 Responses to "Trailing Stars, Chapter 13; by Owlsong"
We don’t use original characters in this fanfic. This story is about all of us users on BlogClan as cats, so we only use one fursona (you as a cat basically) per person. Can someone tell me why this page has suddenly gone silent? *cricket chirps* Never mind…..
Could Skystorm a fluffy, small gray she-cat with blue eyes be put in? My goodness, I didn’t even know I was in Trailing Stars… awesome!! !